Welcome to PAL – the Pathways to Learning programme which supports greater access to library and archives collections and services throughout the island of Ireland. There are currently three PAL resource-sharing schemes, Cork PAL, Music PAL and Midlands PAL which make access easier to libraries and archives throughout the island of Ireland. Read the latest news on PAL below or click here for further information on this initiative. Midlands PAL was officially launched on Friday 7th June at 2pm in the Aidan Heavey Public Library, Athlone by Mr. Phil Hogan TD, Minister for the Environment, Community and Local Government. Midlands PAL is the latest PAL scheme to be set up, in addition to Cork PAL and Music PAL. Midlands PAL aims to create a seamless route to information resources for the public by opening up access to a wide range of midland libraries: public, academic and HSE. These libraries have all been made easily accessible through the scheme. The current participants in Midlands PAL are Athlone Institute of Technology; HSE Midlands Libraries; Laois County Libraries; Longford County Libraries; Offaly County Libraries; Roscommon County Libraries; and Westmeath County Libraries. Working Title: “THE WIND IN OUR SAILS” Shared services – How technology can help us? From clutter to clouds! Summary: This, the 3rd annual Cork PAL training workshop, was great success with a large attendance, some very interesting presentations on cloud computing and federated searching, several updates on Pathways to Learning (Cork and Midlands) as well as very useful workshops on a range of relevant topics. Attendees also were given a very nice tour of the College and its facilities. Users can now view online the music contained in the entire Hudleston Collection of printed guitar music in digital format. This is freely accessible via the Royal Irish Academy of Music online catalogue. 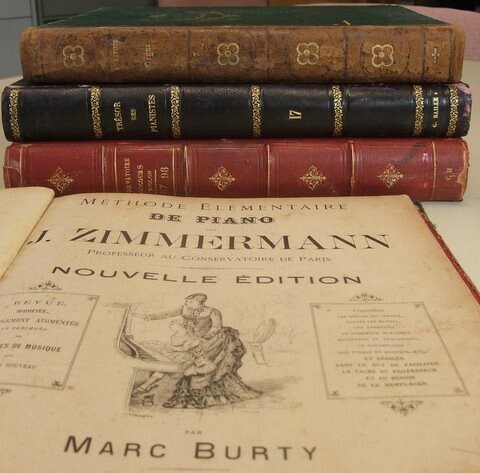 This unique resource, held in the RIAM special collections, contains over 1,000 works for guitar (both solo and chamber music) in original editions from the 19th century. It was the private collection of Josiah Andrew Hudleston (1799 – 1865) who lived for many years in Madras and subsequently settled in Ireland in 1857. Throughout his life, Hudleston collected works for guitar composed by his contemporaries, several of whom he knew personally. This corpus of work represents a very flourishing period in the history of guitar music, featuring composers such as Giuliani, Sor and Carulli, and many other lesser known names. You can search for material by going to our online catalogue http://library.riam.ie and selecting “Hudleston Collection” from the menu of options. We welcome any feedback from users, which can be sent to library@riam.ie. NUI Maynooth Library is delighted to add the music library of renowned French musician Gabriel Baille (1832-1909) to its exceptional research collections. Gabriel Baille was at the centre of musical life in the French city of Perpignan. He composed for organ, piano, orchestra and mixed choir. His music library, of 81 volumes, contains much of interest to NUI Maynooth and St. Patrick’s College Maynooth, particularly with regard to 19th century French editions of instrumental methods, organ music and sacred music. PAL is a COLICO initiative. This site was developed and maintained by An Chomhairle Leabharlanna in co-operation with Trinity College Dublin and Cork Institute of Technology.